"This recipe comes from my Army days where dishes were often created by throwing in everything including the kitchen sink! I've refined it over the years, and this recipe yields a tangy yet sweet and rich sauce that is sure to make your soldiers happy. The sauce is excellent over any pasta." 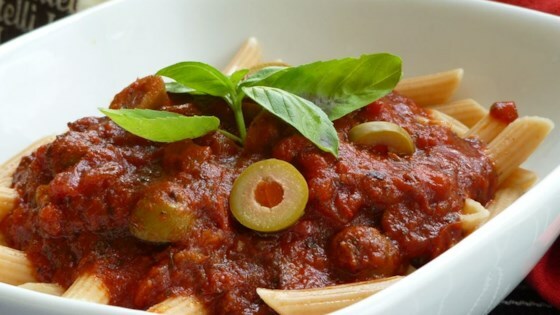 Mix together the crushed tomatoes, tomato sauce, stewed tomatoes, 1 cup of red wine, green olives, 4 teaspoons of sea salt, basil, oregano, paprika, and cayenne pepper in a slow cooker. Set the cooker to Low. While the cooker is warming up, place 3 tablespoons of olive oil in a skillet over medium heat, and cook 3/4 cup of sweet onion until the onion just begins to soften, about 2 minutes; stir in 1 clove of garlic. Cook the mixture for 3 more minutes before mixing in parsley and mushrooms. Reduce heat, and simmer the mixture for about 10 minutes. Stir in the brown sugar, and mix to dissolve. While the parsley and mushrooms are simmering, heat 3 more tablespoons of olive oil in a skillet over medium heat, and stir in the remaining onion and the sausage. Brown the sausage, breaking the meat up into crumbles as it cooks, about 10 minutes; season the mixture with white pepper and cumin. Pour 1 cup of red into the skillet, and scrape the pan with a wooden spoon to dissolve any brown flavor bits into the wine. Simmer for about 10 minutes; pour the sausage mixture into the skillet with the parsley and mushrooms. Bring to a simmer over medium-low heat just until all the ingredients have had time to introduce themselves to each other, about 10 minutes. Pour the sausage mixture into the slow cooker. Cook on Low for 8 hours to overnight. Add more red wine or water if needed to prevent the sauce from getting too thick and burning on the bottom. A slow-simmering sauce with sausage, mushrooms, and red wine. The best spaghetti sauce I have ever cooked. Worth all the effort.